When you have a missing tooth or a denture that hasn’t been properly fitted, you risk exposing your healthy teeth to disease that may be very difficult to treat. Missing teeth can have social and personal impacts. You lose your confidence to smile, speak or and have nutritional impacts that affect your overall health. Bear in mind that foods that are higher in fat are usually easier to chew. Hence you can have negative impacts on your diet because of chewing problems. A lot of research has been done to improve dental implant technology. Implants can help address issues like partial or complete loss of teeth which continues to be a big problem today. For a long time, individuals had complete dentures in order to replace lost tissues of the teeth, bone and gum. Though dentures did a good job at helping to replace lost tissues, they did not have a great effect on improving teeth function. Most people find upper dentures more comfortable than the lower denture. With a lower denture, the stability and comfort is usually a problem that wearers experience and often seek better alternatives to replace lost teeth. What happens when you lose lower teeth? When teeth are lost, whether on the upper or lower jaw, the supporting bone of the teeth also experience significant changes. The bone quality and bone quantity is compromised when there is a missing tooth. The bone is reshaped as part of the healing process. Therefore, the shape and height of the remaining bone is lost significantly. This is why when dentures are fitted, they tend to become loose. The bone loss that is experienced in the lower jaw is far greater than on the upper jaw. Bone loss is usually very rapid in the first year hence the need to consider tooth replacement immediately. The bone loss will continue over the years and this is why dentures tend to become loose overtime. The tongue is a strong muscle that can displace a lower denture which is one of the reasons that makes it harder to wear. One reason to consider dental implants as opposed to dentures is that they can help you to significantly improve your quality of life. Dentures can have psychological and social impacts when they become uncomfortable to wear or move around when you speak. With technological advancements, there exists another option that is better than dentures or complete implants. This is the lower jaw two-implant overdenture. 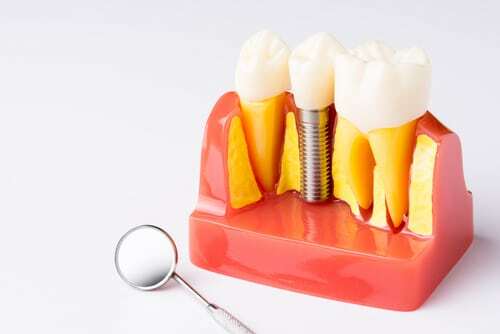 Commonly referred to as an implant retained denture, this procedure is designed to combine the advantages of a denture as well as those of dental implants. Two implants are used in order to support a traditional denture on the lower jaw. The denture is customized in order to fit on the new platform. Once the two implants are placed and the denture is installed over them, the overdenture procedure is complete. Discuss with your dentist the possibility of having this procedure done.